WEGEN PICKS. GYPSY JAZZ, BLUES, JAZZ & ELECTRIC GUITARS, MANDOLIN AND BANJO. I have to adjust my pick holding technique in order to play bluegrass and the drilled holes in this pick have really help me to do this. It doesn't slip. It sounds brighter than most other picks. It has a nice thickness and weight that gives a good fundamental tone when hitting the strings with conviction. Either strummed or single notes ring out nicely. A great pick for medium gauge strings. JIM DUNLOP PICKS. NYLON. GRAY. 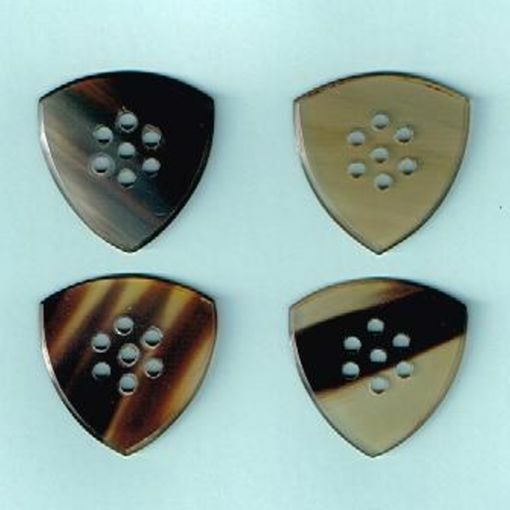 JIM DUNLOP PICKS. JAZZ 111 XL. SPECTRA PICK. A GOOD ALL ROUNDER. GYPSY JAZZ 250 PICK. HAND MADE FROM BUFFALO HORN.